NCI offers air showers for cleanrooms that are designed to effectively and efficiently remove surface contamination from both people and products. Our cleanroom airshowers are constructed of cold rolled steel with a white, baked enamel finish. The air shower unit is shipped in five easy to assemble pieces. 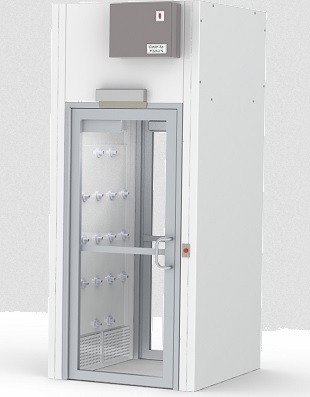 Our cleanroom air showers are completely self-contained with only an electrical power connection needed for operation. Adjustable cleanroom air shower nozzles allow for optimizing air flow for different sizes of people. The cleanroom class 100 HEPA filtered air discharges out of the air shower's nozzles at 7,800 feet/min. The air and particles are drawn to the return air grills at the floor of each cleanroom air shower and return to the blower and filters via hollow wall cavities for refiltering. NCI offers many different standard and custom sizes and shapes of air showers for cleanrooms. Many of the standard varieties for personnel passage include straight through showers, 90-degree turn showers, and many lengths of tunnel style air showers. Custom styles can include features such as low profile heights, ADA compliance, multi-door units, and smaller versions just for the passage of carts, parts, and/or pieces. Contact us for more information on our cleanroom air showers.